November 21st, 2016, Charlottetown – P.E.I. speed skaters swept the podium in the top division at the 25th annual Atlantic Cup Speed Skating Championships held recently in Charlottetown. Peter McQuaid of Charlottetown grabbed Division 1 gold, edging his brother Andrew McQuaid. The McQuaid siblings traded wins in the first three events, before the decisive final race of the weekend, where Peter took the win after Andrew crashed and took a penalty. Andrew Binns of Stratford rounded out the Island trio on the podium, taking the bronze medal after setting a new provincial record for juvenile boys in the 1000 metre distance. 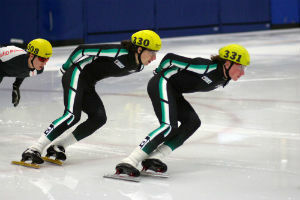 Peter McQuaid (right) and Andrew McQuaid (centre) of Charlottetown took the top two positions to lead the Island contingent at the recent Atlantic Cup Speed Skating Championships in Charlottetown. Photo courtesy of Kristen Binns. Carly Connell took another gold for P.E.I., with a convincing win in Division 2, while Alyssa Rusk of Fredericton took the silver and AbbyGail Jackson of the Codiac Cyclones rounded out the top female finishers with bronze. Island skaters took a total of 7 gold medals, with Jenna Larter (Division 4), Anderson Arseneau (Division 8), Dennis O’Shea (Division 13 male), Una Grant (Division 13 female) and Sarah Taylor in the Masters division also stepping to the top of the podium. Larter nabbed her first provincial record, taking 1.5 seconds off Miriam Burnett’s 2015 record for 14 year-old girls in the 1,500 metre distance. Arseneau used wins in his two longest distances to earn the gold medal, while O’Shea had a perfect weekend with four wins. For Grant, the gold medal was her first medal, in just her second competitive outing. Taylor took the win in the Masters division, after setting new provincial records for Masters women (30 – 39 years) in all four of her distances. Silver medalists for the host Island team also included William Lyons of Rock Barra in Division 4, Julian Christy in Division 10 and Ava Reynolds in Division 13. P.E.I. skaters taking bronze medals included Liam Chatfield (Division 5), Addison Bruce (Division 7), Saul Grant (Division 11 male), Holly Nickerson (Division 11 female) and Brendan Reynard (Division 12). William Lyons (left) of Rock Barra grabbed a silver medal for P.E.I. at the recent Atlantic Cup Speed Skating Championships in Charlottetown. Photo courtesy of Kristen Binns. P.E.I. was well represented in Division 1, with Kyle Connell, Rob Binns, Thomas McQuaid and Matt Kozma also flying the Island flag. Binns set a pair of new P.E.I. record times for Masters men (40-49 years), bettering his own provincial marks in the 500 and 1000 metre distances. The meet saw a large field of 171 skaters take to the start line, including skaters from six provinces as well as from Nunavut taking part. P.E.I. topped the medal standings with seventeen medals, while Fredericton took home eleven medals. Nunavut and the Humber Valley club from Newfoundland also had strong showings, each earning seven medals to start the new season. Island speed skaters are back on the ice in a pair of competitions this weekend, as Andrew and Peter McQuaid will represent P.E.I. at the Canadian Open National Qualifier in Saguenay, QC, starting on Thursday. Meanwhile, eighteen members from the Island Club will compete in the Harold Joyce Invitational Short Track Championships in Fredericton, N.B. on Saturday and Sunday. For full Atlantic Cup results and more information about Speed Skate PEI and upcoming competitions, visit www.speedskatepei.com.